Pohang University of Science and Technology (POSTECH), South KoreaThe Department of Life Sciences is seeking to appoint outstanding scholars to tenure-track or tenured faculty positions beginning in the 2018 academic year.Qualified applicants with an outstanding record of research accomplishments in 1) Systems Biology, Bioinformatics, or Computational Biology, 2) Developmental Biology, Stem Cell Biology are highly encouraged to apply. 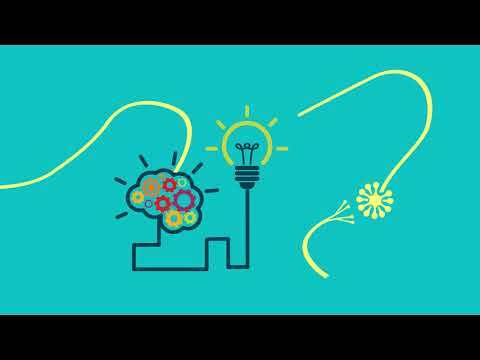 Candidate(s) should be committed to pursuing multidisciplinary research and education. The position and salary will be commensurate with a candidate’s experien.. The Department of Industrial and Management Engineering at Pohang University of Science and Technology (POSTECH) invites applications for two full-time, tenure-track or tenured faculty positions. We are seeking candidates with a research focus in the two areas, (1) Financial Engineering (including Finance, Mathematical Finance, Actuarial Science) and (2) Human Factors Engineering (HCI/Cognitive Engineering/UX), but outstanding applicants in the other areas of Industrial and Management Engineering will be also considered. The successful candidates are expected to establish a strong research pro.. Faculty Positions AvailableThe Department of Mathematics at Pohang University of Science and Technology (POSTECH) invites applications for several tenure-track faculty positions in all areas of Mathematics. The positions are primarily at the Assistant Professor level, but senior candidates with strong credentials will also be considered for higher-level appointments. The positions are open to mathematicians of any nationalities who are fluent in English. New faculty members are provided with start-up research funds and competitive benefits packages, including ten-year rent-free faculty accom..
◈ Registration Period: Mon, June 12, 2017 (10:00 am) – Sun, June 18, 2017 (6:00 pm) ◈ Payment period: Mon, June 12, 2017 (10:00 am) – Sun, June 18, 2017 (6:00 pm)Payment will not be accepted after this period.◈ Duration of the session: Mon, June 26, 2016 – Fri, July 28, 2017 (for 5 weeks)◈ Who are eligible to register?All POSTECH students (undergraduate/graduate), researchers, faculty, staff, and their family members (except elementary, middle and high school students), students who are on a leave of absence but are scheduled to re-register for the fall semester of 2017, as well ..
Tenure-Track Faculty Position in Condensed Matter Physics, Optics,.. 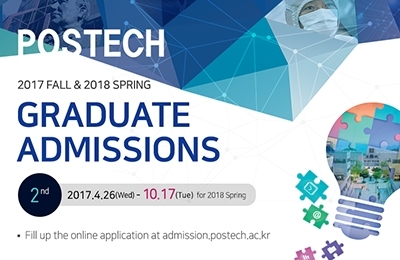 The Department of Physics (http://ph.postech.ac.kr) at Pohang University of Science and Technology (POSTECH http://www.postech.ac.kr/eng/) has openings of three tenure-track faculty positions in Condensed Matter Physics, Optics, and Biophysics starting from the fall semester 2017 or spring/fall semester 2018.We seek candidates with the potential to create world-renowned research program at POSTECH. Successful candidates are expected to have international recognition in their field or a demonstrable potential for such. They are expected to establish and execute an independent research group at .. The Department of Industrial and Management Engineering at Pohang University of Science and Technology (POSTECH) invites applications for two full-time, tenure-track or tenured faculty positions.We are seeking candidates with a research focus in the two areas, (1) Financial Engineering (including Finance, Mathematical Finance, Actuarial Science) and (2) Human Factors Engineering (Cognitive Engineering/Affective Engineering/UX), but outstanding applicants in the other areas of Industrial and Management Engineering will be also considered.The successful candidates are expected to establish a str..